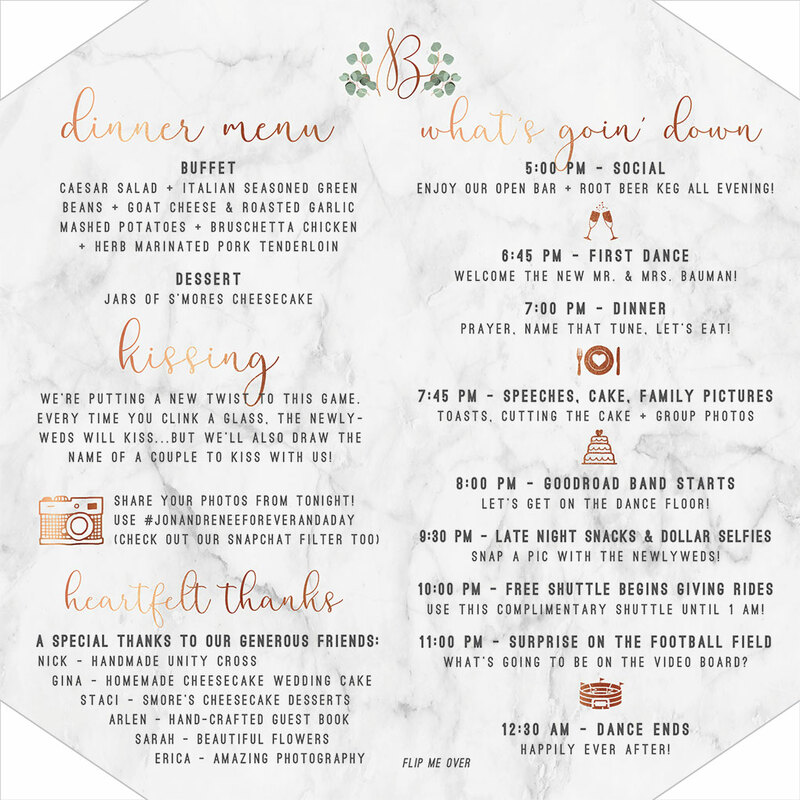 I’ve been a wedding planner for over five years and have been a part of 60+ weddings. I am joyfully obsessed with wedding details and making sure each couple gets a wedding that is perfectly THEM! That means I look for ways to bring out the personality of the couple, hobbies, interests, special ways to remember loved ones who have passed, etc. I love me some Pinterest, but I don’t want someone’s wedding to be completely manufactured from Pinterest. My job is to bring out special things about their love story. My own wedding was no exception. I’ve seen my fair share of weddings and I knew I wanted mine to be a *bit* different. 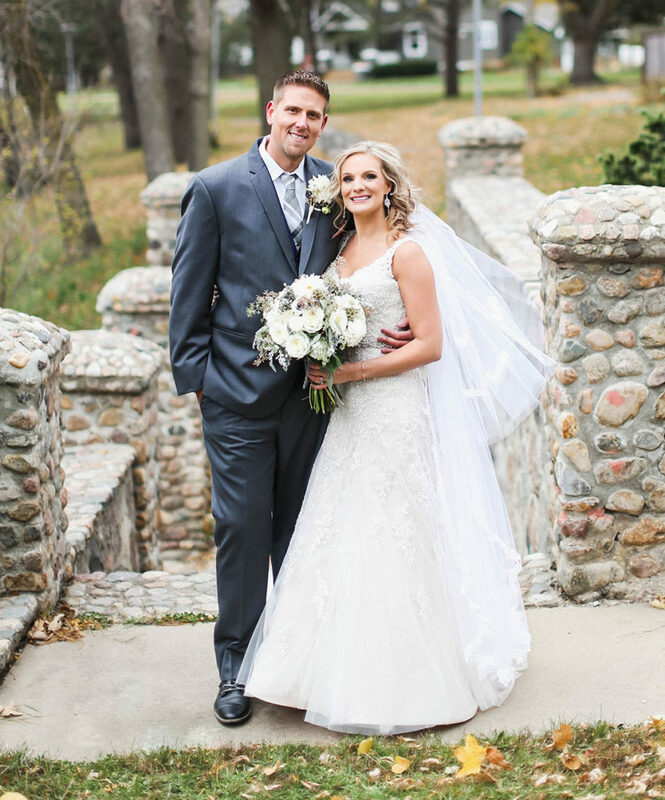 Here are some ways I — a wedding planner from Brookings, South Dakota — made my wedding memorable and personal. I made up most of these ideas, which made them so much fun! Use any ideas you’d like! Leave what you don’t. 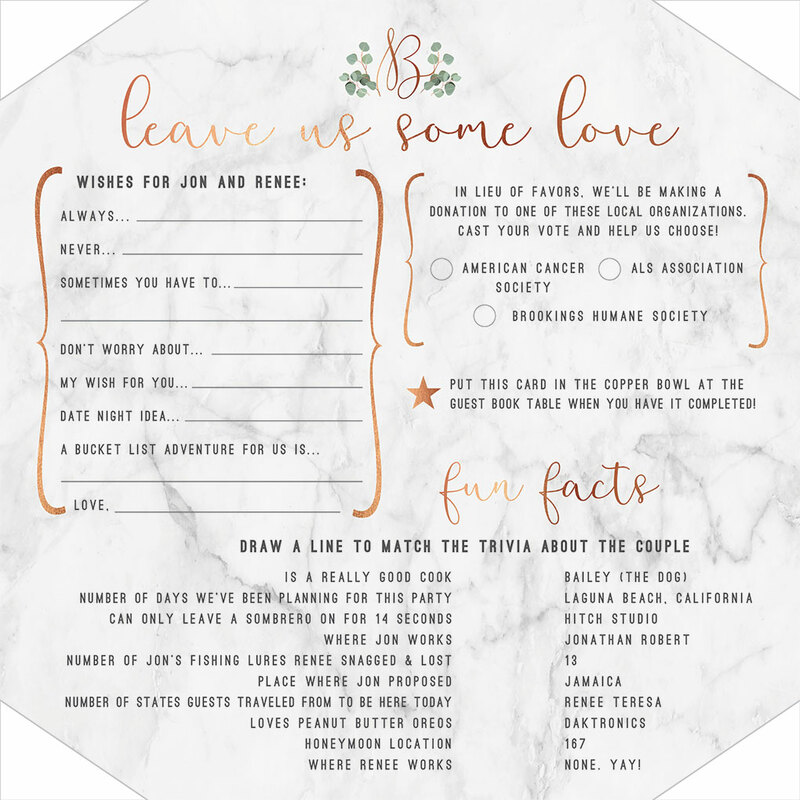 I want your wedding to be personal for you too! We chose to get married on a Friday. It was so much fun to have an extra day (Saturday) with friends and family before they went home on Sunday. Plus, venues and vendors were more available! Did I mention we planned our wedding in five months? I think that might be a unique feature of our wedding. Don’t think you can have a short engagement? You can. Ask Hitch if you need help! We booked a venue that I had never coordinated a wedding in before. I know the ins-and-outs of plenty of venues in Brookings, South Dakota, but this one was special. This one felt original and new to me. It felt like ours. 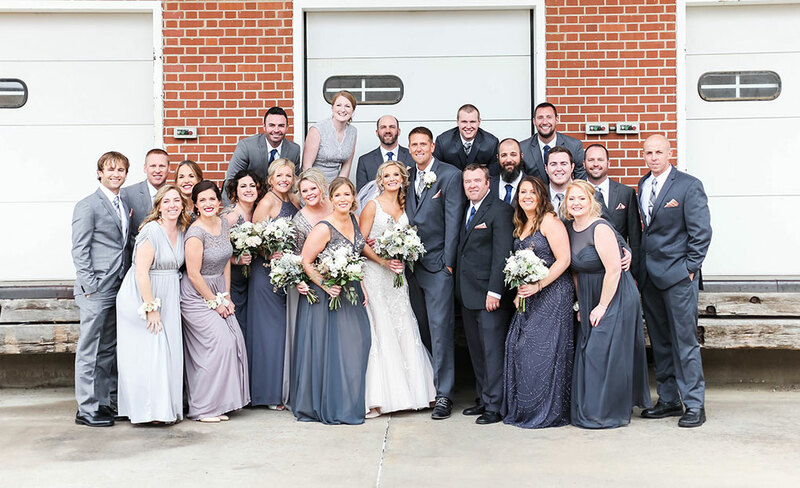 I had five bridesmaids and six personal attendants. The six personal attendants were close friends that I wanted to be a part of our day. 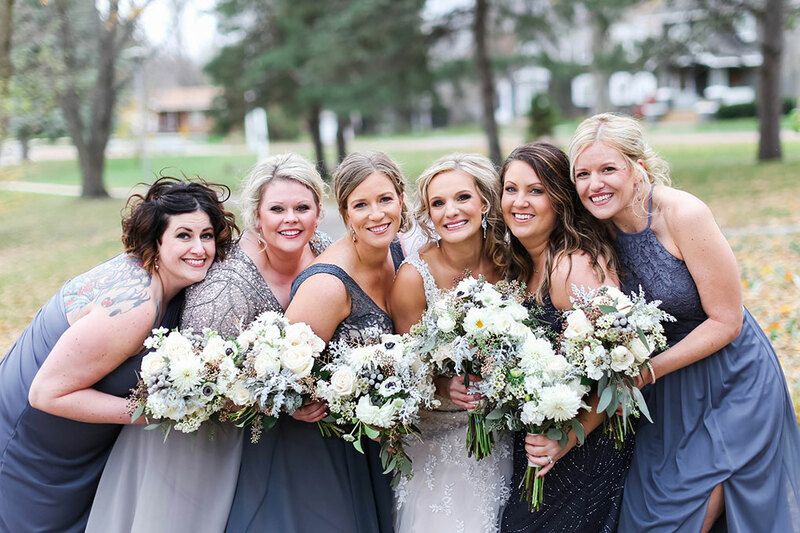 They each walked down the aisle in front of the bridesmaids and sat with their families during the ceremony. I had the florist make them wrist garlands instead of full bouquets. 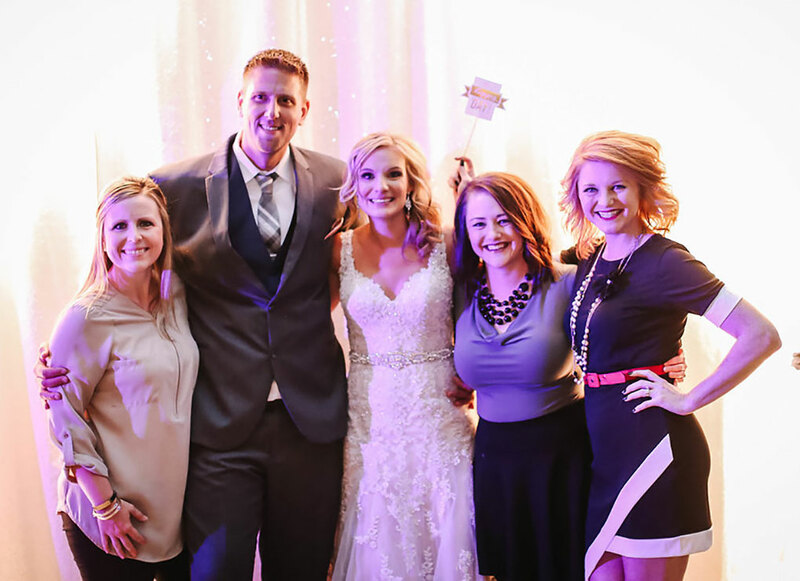 I loved having ALL my close friends in our ceremony. They each wore floor-length dresses and we all took photos together. Our flower girls were our four grandmothers. Jon and I only have grandmothers left — our grandpas have all passed away and looked on from heaven on our wedding day. So, we thought it was very special to have them walk down the aisle as our flower girls. They didn’t sprinkle flower petals…they are just the women we love the most on our family trees. During the ceremony, I had a close friend (one of my personal attendants) and Jon’s cousin sing two VERY special songs. One was from Jon’s parent’s wedding and makes me cry every time I hear it — “He Has Chosen You For Me”. The other was “Prayer of St. Francis” in loving memory of my Grandpa Frank. We had a good friend of ours hand-carve our unity cross. It was a really special to know the hands of a dear friend made our symbol of unity. We surprised our mothers after the unity ceremony with two bouquets of flowers. During the song, Jon handed my mom a bouquet and hugged her…and I handed Jon’s mom a bouquet and hugged her. (And I cried, of course.) It was a way of saying “I am going to take care of your little boy/girl for as long as I live” through flowers, a caring smile, and a hug. 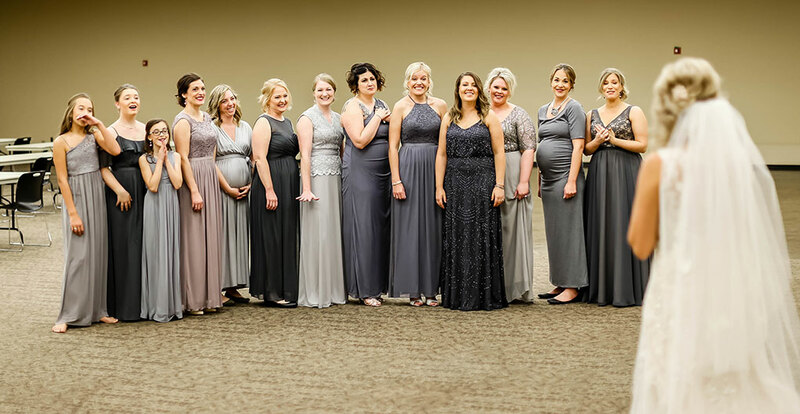 Our wedding party got to choose whatever they wanted to wear, as long as it was a shade of gray. It looked so great! The girls got to pick out any dress in any price range from any store, as long as it was gray. The guys got to rent or buy or use a suit they already had. We provided the navy ties — and it all came together nicely. Our ring bearers were all our nieces and nephews. 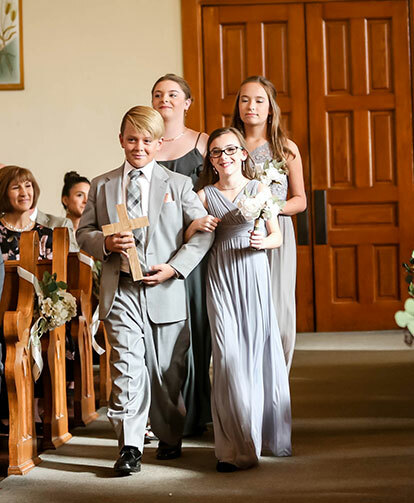 Each girl carried a bouquet up the aisle and Nick, our solo guy, carried the cross we used for our unity ceremony up the aisle and laid it on our unity table. Our officiant was a priest from Jon’s parents’ hometown. He traveled all the way from a different parish just so he could be the one to marry us. His homily was nothing short of amazing. Our head table was a U-shaped King’s table. It held 56 people. 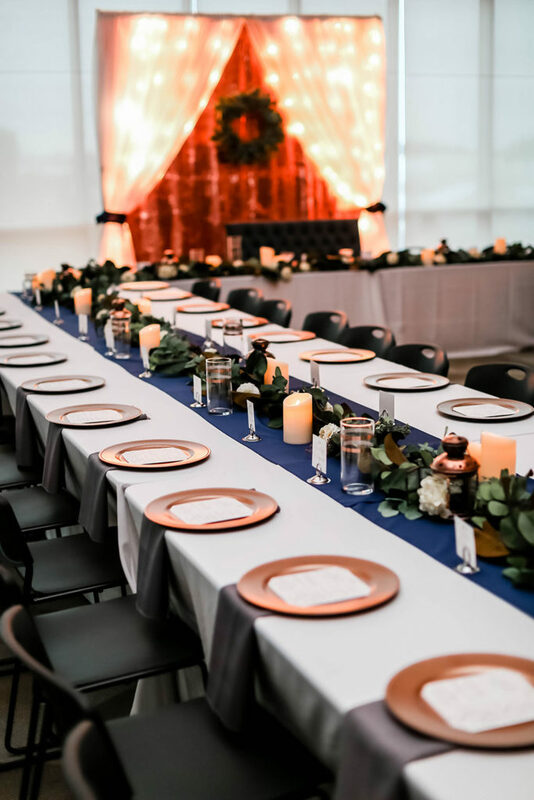 Again, I wanted everyone in our bridal party to all sit together with their families at our head table, including our parents and the officiant. 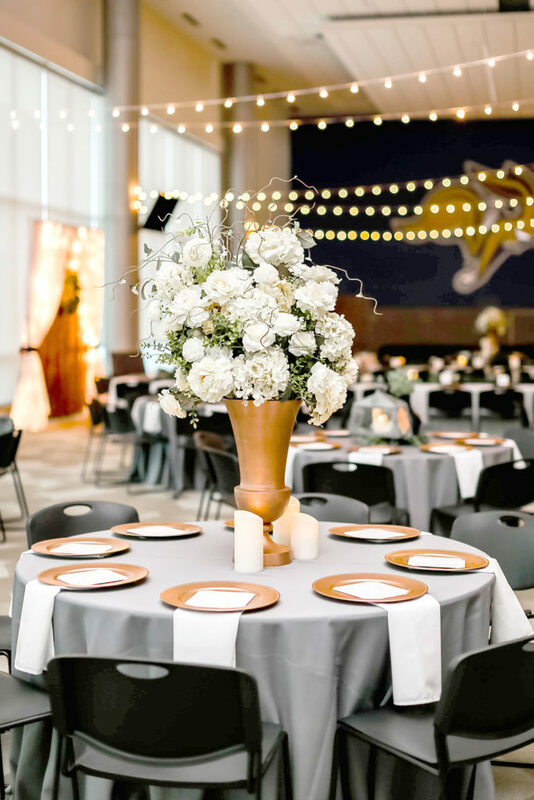 I wanted one big table of love…instead of leaving a table of significant others sitting in the back of the room trying to wrangle all the kids themselves. Nope. Join us in the middle of the room together with your families. We love all of you! When we got to the reception, typically the grand entrance announces the bride and groom last. Not for us! 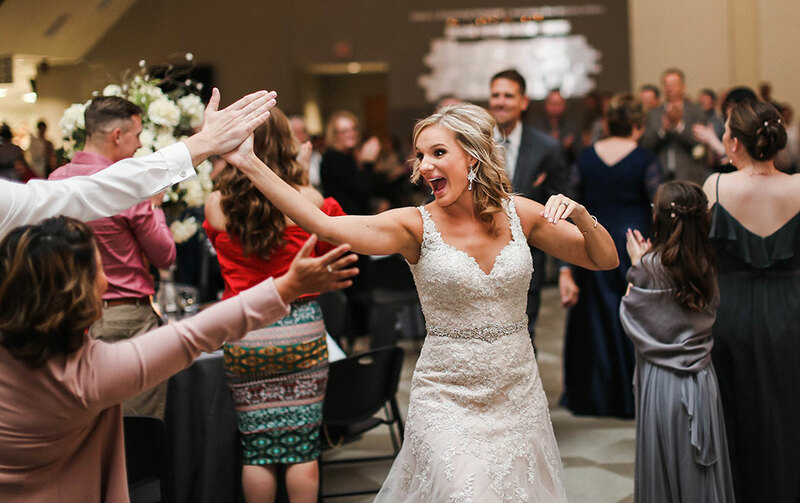 We booked a band and they announced Jon and I first, so we went right into our first dance (and high-fived guests as we celebrated and ran through the crowd to the dance floor!) They played the Florida Georgia Line song “H.O.L.Y.” and then the band transitioned into a medley of other Florida Georgia Line songs as our wedding party joined us on the dance floor two by two! By the end, all 24 of us were jammin’ on the dance floor. It was the BEST. The whole reception crowd was cheering. During our first dance songs, we invited others to join in dancing with us. 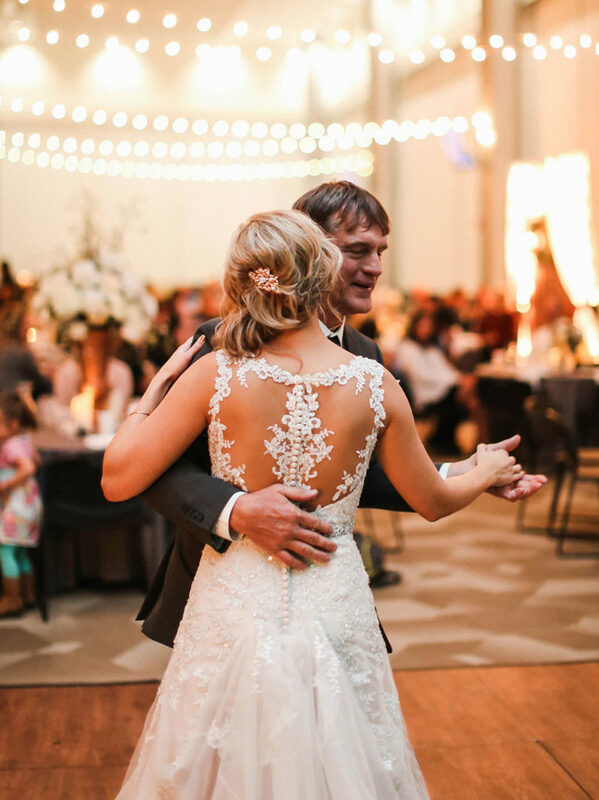 For example, when my dad and I danced for about a minute, the band announced that “any daughter who was here with her dad tonight can join Loren and Renee on the dance floor!” And when Jon and his mom danced, the band asked any son who is here with his mother tonight, join them on the dance floor. Finally, when I danced with Jon’s dad and he danced with my mom, we asked everyone to join us on the dance floor as two families became one. People loved it. I really loved that we had a band instead of a DJ. We planned a game so that whatever song the band was playing, a table full of people had to be the first to guess the song. Playing “Name That Tune” in order to be the next table dismissed to the buffet line was hilarious. Jon’s favorite dessert is cheesecake, so instead of traditional cake, we had a close friend (famous for her cheesecakes) make us our two-tier cheesecake. I love Oreos, so she made sure it had an Oreo crust. We saved it and ate the top tier on our first anniversary! 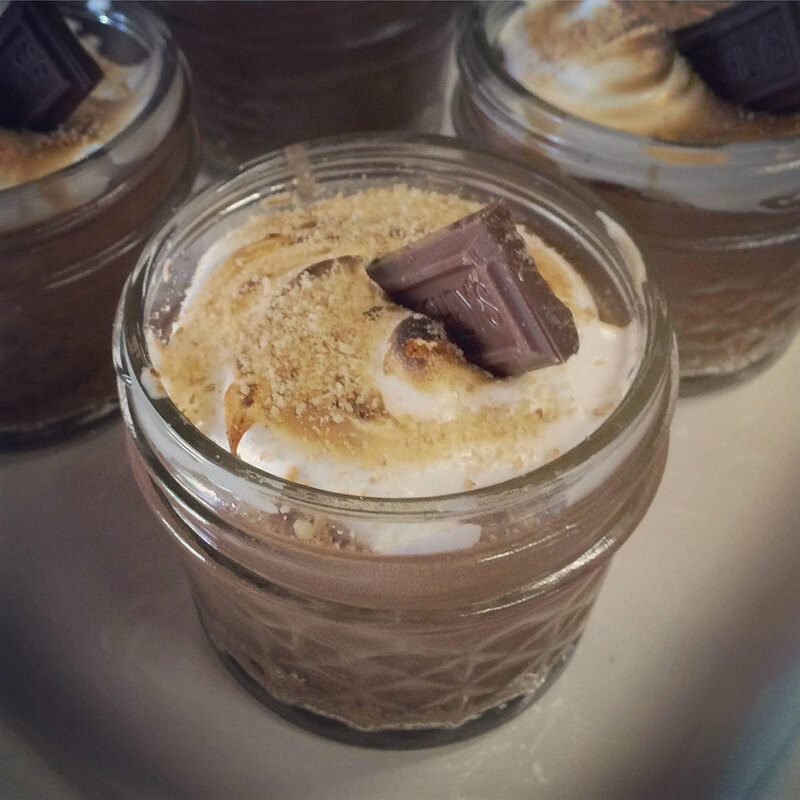 Since we had a fall wedding, we also opted for s’mores cheesecakes in little jars for all of our guests! People were taking them home in their pockets by the end of the night, they were such a hit. Once again, we had a close friend make 368 jars of s’mores cheesecake, complete with Hershey bar on top and toasted marshmallow topping. Amazing. The summer before we were married, I happened to catch the “throw bouquet” at our friends’ wedding. You know what that means! And sure enough, we were the next to get engaged and married. So, during my rehearsal, I carried THAT bouquet down the aisle. It seemed very fitting — and I still have it in my bedroom next to my actual dried-flower bridal bouquet. 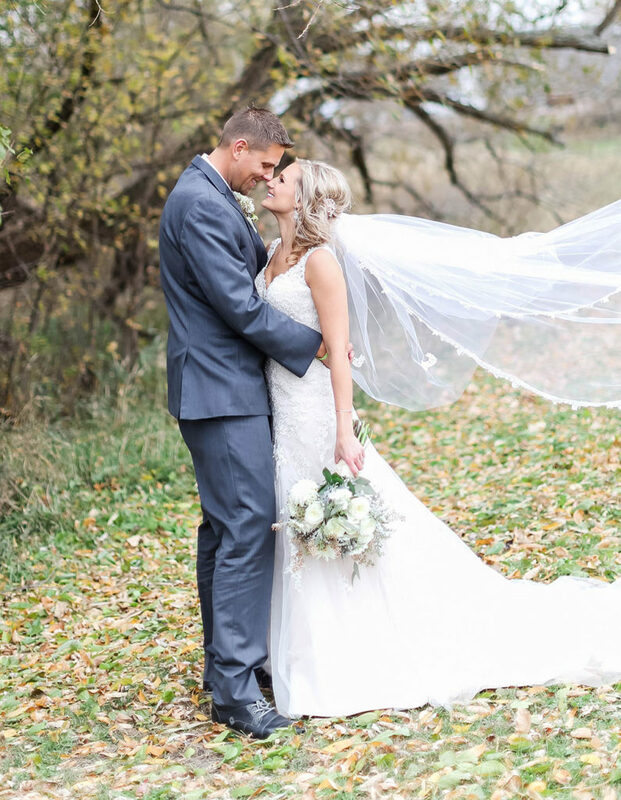 My something old, something new, something borrowed and something blue were pretty special: Something old — I used my mother’s veil from her wedding day. When we got the veil out of her preservation box, I also got to try on her wedding dress! So special!! (Plus, it zipped! Whoo!) Something new — my gorgeous dress. Ah. Still in love with it. If I could wear it everyday just to vacuum around the house, I would. 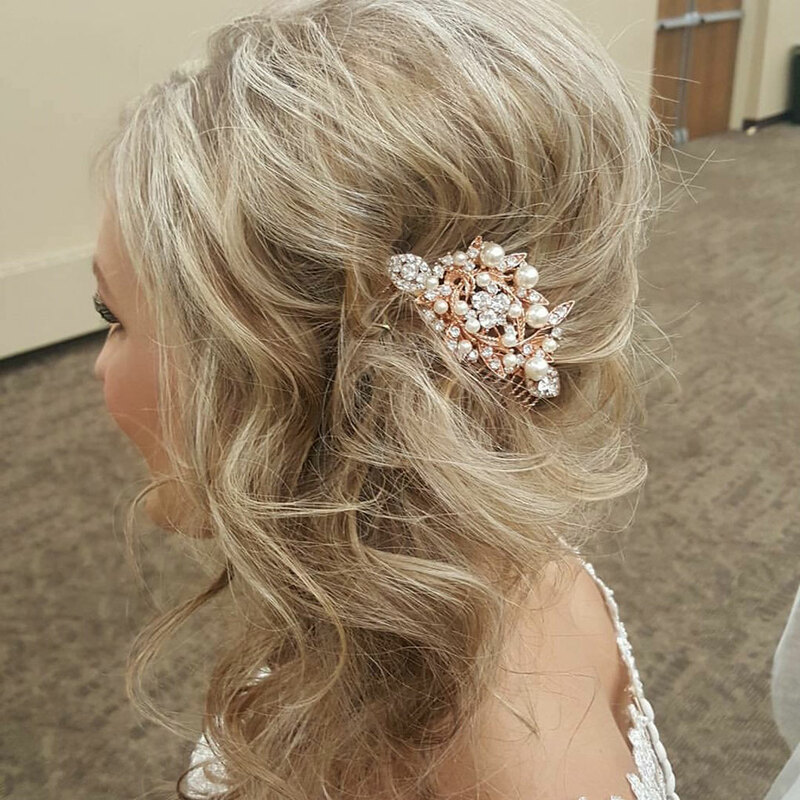 Something borrowed — I borrowed a crystal + copper hair piece from our very first employee at Hitch Studio. Her graciousness meant the world to me. 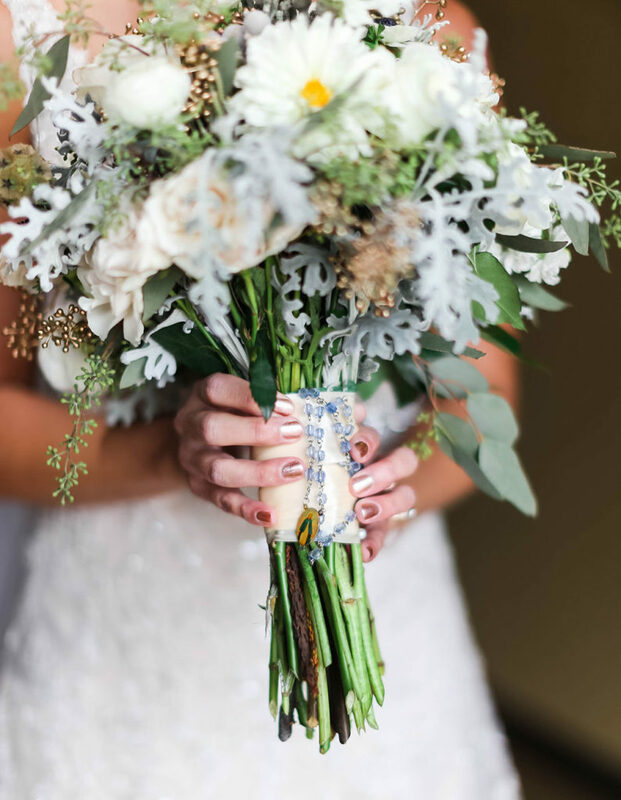 Something blue — I wrapped the stem of my bouquet with my grandmother’s blue-beaded Rosary from Rome. I will treasure it forever. We asked Jon’s aunt and uncle to make our guest book. They did an incredible job building a huge frame out of wood that our guests signed with white paint pens. What a keepsake hanging in our home. When I put together the “Will You Be My Bridesmaid?” boxes for the girls, each one got a necklace hand-made by a local jeweler. Hitch Studio now shares a space with that jewelry artist and I just LOVE how they turned out! I also LOVE that I can call Sarah a dear friend. For our “thank you” gifts to our wedding party (including all hosts/hostesses, ushers, personal attendants, etc. ), we put together gift bags of special items from our town of Brookings, South Dakota. 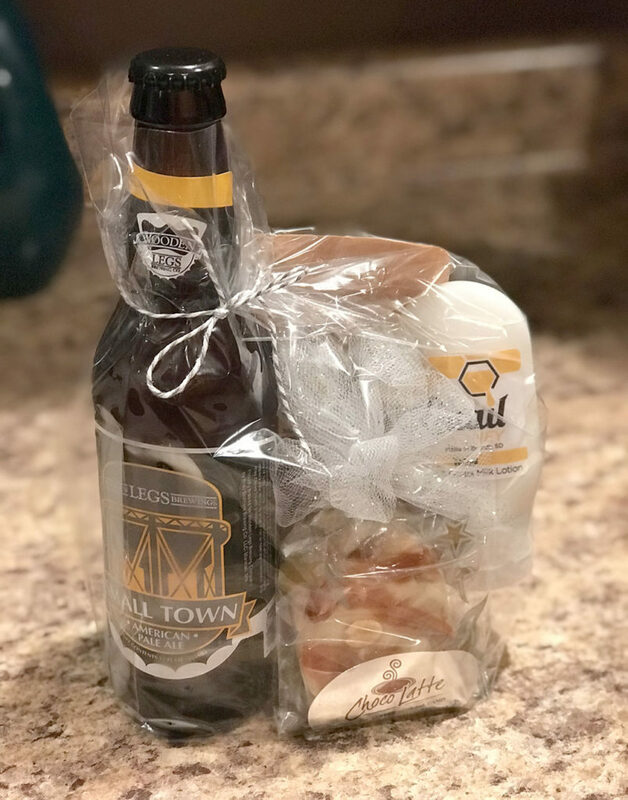 We included fudge from the local candy shop, craft beer from our favorite brewery in town, honey lotion from Quail Honey, and more. 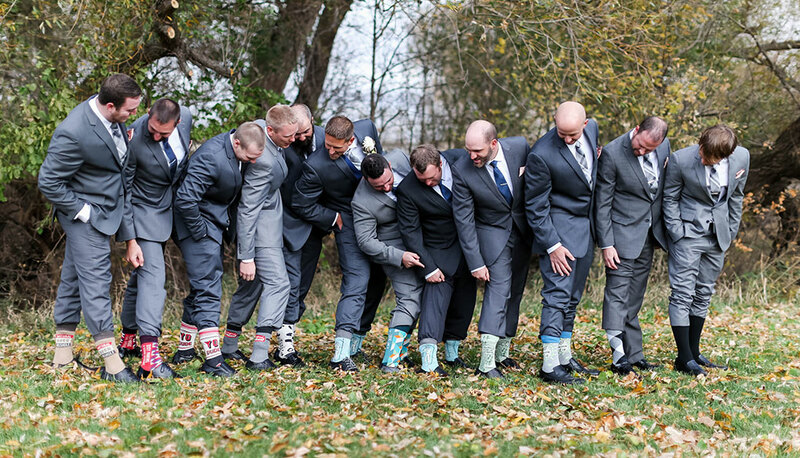 We made sure all the guys got funny socks to wear the day of the wedding, and the girls got hand-made earrings in their gift bags — all found/made locally. Instead of a “dollar dance”, which I think can get a bit long, we had a “dollar selfie” booth! (At every wedding, I always want to take a photo with the bride and groom, but rarely does the opportunity present itself to take one together.) So, pay a dollar and take a selfie with Renee and Jon during the band’s break! We also had our photographer there, capturing all the photos for us to see, too. I loved this spin on the dollar dance! While we were taking photos after the ceremony, our guests arrived at the social hour and reception before us. To help keep them entertained, we had appetizers and fun activity cards at every guest place setting on top of the charger and napkin. On the menu cards were trivia about me and Jon, the schedule for the evening, our wedding hashtag, and fill-in-the-blank well wishes for the couple. Each guest could turn theirs in, in a box near the entrance. It was so fun to be able to collect them all and read them the next day. (Plus, it made me feel better and was more eco-friendly than throwing away so many menu cards when people were done with them!) We still laugh at a few of them and will keep them forever! Part of that activity card was what we decided to do instead of favors. In lieu of spending money on favors, we had guests help us choose by “voting” on a charity we would donate to instead. We chose our top three charities as options, and when guests filled out their activity card, we could tally them up the next day and donate to the winner. As a final surprise at the end of the evening, Jon and I had a friend record a video of each of us. Neither of us knew what the other would say when asked, “How did you know when you were in love with Jon/Renee?” So, it was a surprise for both of us when we got to see each other’s answers played on the GIANT scoreboard display at the SDSU football field! All of our friends and family gathered outside during one of the band breaks and watched the video. So fun! • What do you enjoy doing together in your free time? What are hobbies for each of you? • What defines you as a couple and makes your friends say “Yep. That’s so THEM”? • What are your favorite foods, drinks and snacks? • What’s a favorite vacation you’ve taken? • Where did you meet? • Where did you get engaged? What is your proposal story? Does it have special meaning that you want recreate? I encourage you to add anything non-traditional, fun, quirky, or unexpected into your wedding day to make it that much more special. Your guests will probably love the variety and remember those fun details. You’ll look back and be so thankful you did. Happy planning! And contact Hitch Studio if you need help making any of these dreams come true! “Will You Be My Bridesmaid?” gifts! The locally-made gift bags we gave to our ENTIRE wedding party. Our U-shaped, 56-person head table. Chargers, eucalyptus, candles, and vases for the girls’ bouquets. High fives as we headed to our first dance. So fun! Shortly after this photo was taken, we asked any daughter in the crowd to join her father on the dance floor with us. 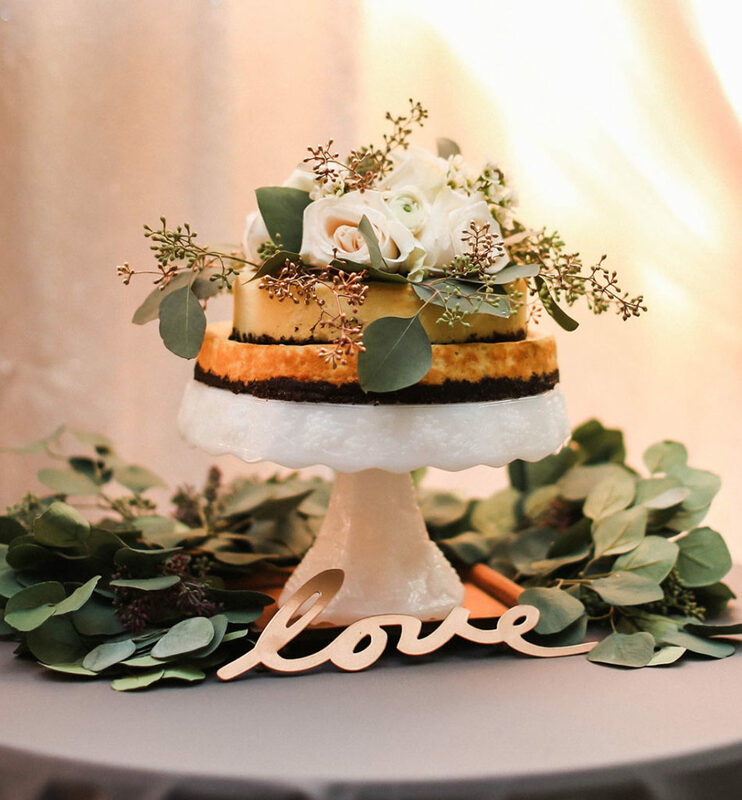 Our Oreo cheesecake wedding cake. 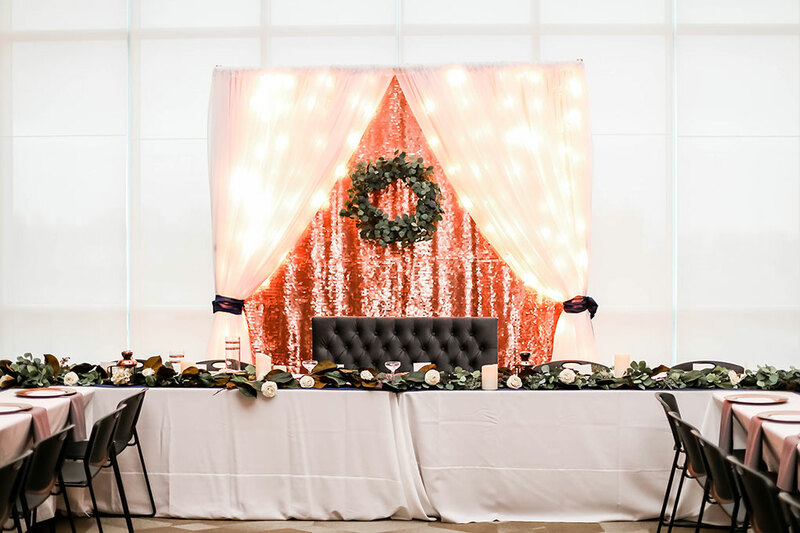 This reception venue was perfect for us. And original to me! Just one of our favorite “dollar selfie” photo booth pics! Pick a gray. Any gray. Can you see the wrist garlands on my personal attendants?